Hereby you’ll find rituals to realise in front of Eggun that are convenient to do when in a consultation of the diloggun appears the sign okana and some of its combinations as okana tonti ogunda, okana tonti oshe, okana tonti odi, okana tonti ofun and okana tonti merinla. Oguidi.- It is left at the feet of Eggun for three days and then it is taken to the gate of the cemetery, provided to confirm the place where you have to leave it with Obi (coconuts aracle). Eko.- After leaving it at the feet of Eggun for three days, confirm the place with Obi (coconuts aracle). Olelé.- It is left for three days at the feet of Eggun and then asks confirm the place to bury the offering with Obi (coconuts aracle). Ekru hoop. Leave it for three days and then ask where the place where you have to leave it with Obi (coconuts aracle). These offerings are prepared without salt, although they can be presented at the feet of other Orishas and in that case if salt and other ingredients can be added, depending on the Orisha. Eggun offerings are normally made in the number of nine, that is, nine oguidi, nine eko, nine olele, etc. 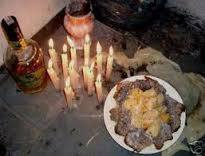 The offerings can be made of fruits, desserts, fresh meat, pieces of bread, drinks with or without alcohol.